Looking for an opportunity to grow your sales? Government contracting may be an avenue to consider, as it can provide long-term growth for a wide variety of businesses. Every level of government buys goods and services, spending billions of dollars, annually, even during times of economic uncertainty and reduced spending. 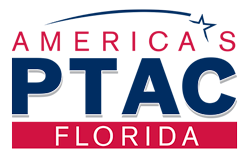 Government Contracting Services available through the Florida Procurement Technical Assistance Center (Florida PTAC) offer high-value confidential one-on-one consulting, at no cost, to help Florida businesses prepare, research, and bid on government contracts. Our Procurement Specialists are knowledgeable, experienced and eager to assist you in making selling to the government less complicated and more profitable. Register for Upcoming Government Contracting Workshops! The federal government contracting system is a process composed of three phases. We take you through the three phases as well as provide frequently used Government Contracting websites. The FSBDC at FGCU has created Slide Show Presentations on Government Contracting. Here you’ll find full-featured presentations created in PowerPoint. Here you’ll find our extensive list of other Government Contracting Resources and Information. The FSBDC at FGCU has compiled a list of Federal, State, County and City Contracting Offices in Florida.